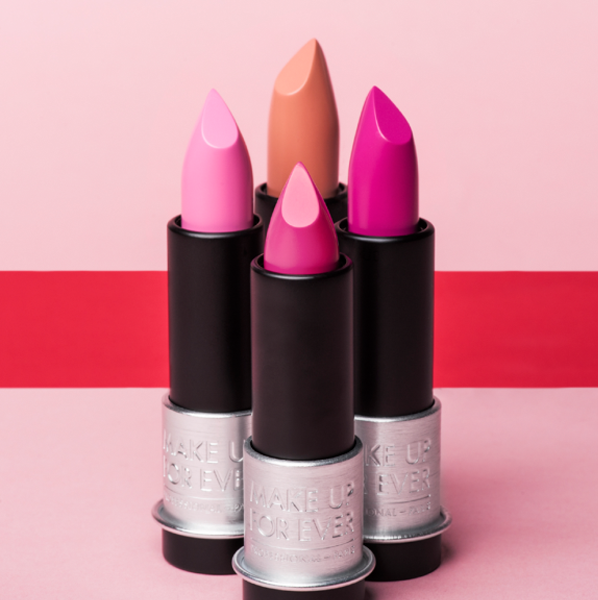 Lovers of makeup everywhere, rejoice – MAKE UP FOR EVER has launched at Escentual, and it’s set to transform your makeup bag. That’s not something that I say lightly; MAKE UP FOR EVER is well-known (and very well-loved) for its creative and transformative approach to makeup. Its emphasis upon vivid pigment, long-wearing formulas and incredible textures has made it the go-to brand for makeup artists working on both stage and screen, and all makeup lovers who want to achieve professional results. If you want a product that is instantly impactful and goes the distance, this is the brand you come to! With such a wide range of incredible products to choose from, where do you start? We quizzed MAKE UP FOR EVER fans to discover the 10 products that no makeup lover should be without, and here are the icons you shouldn’t miss..
Everyone knows that the secret to a long-lasting, perfected base lies in the prep work! 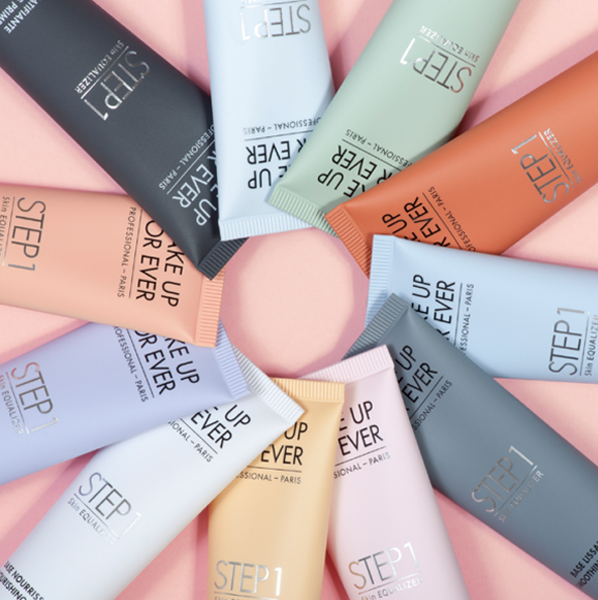 The creme de la creme of MAKE UP FOR EVER’s primer line-up is Step 1 Skin Equalizer, a comprehensive line of 10 targeted formulas that answer just about every complexion concern that your skin can have. • 1 Mattifying Primer A long-lasting matte result with reduced pore size for oily skin. • 2 Smoothing Primer A blurring and perfecting primer for texture concerns. • 3 Hydrating Primer A quenching primer that will refresh and plump tired skin. • 4 Nourishing Primer A moisture-rich, pampering primer for dry skin or winter use. • 5 Redness Correcting Primer Instantly neutralise red tones with this green primer. • 6 Radiant Primer Cool Pink An energising rosy boost for fair skin with yellow undertones. • 7 Radiant Primer Blue Ethereal radiance for fair skin with yellow and red undertones. • 8 Radiant Primer Peach This peach shade adds a subtle healthy glow to fair skin. • 9 Radiant Primer Yellow Extra dimension and brightness for tanned skin. • 10 Radiant Primer Caramel Enhanced radiance for deeper tones. 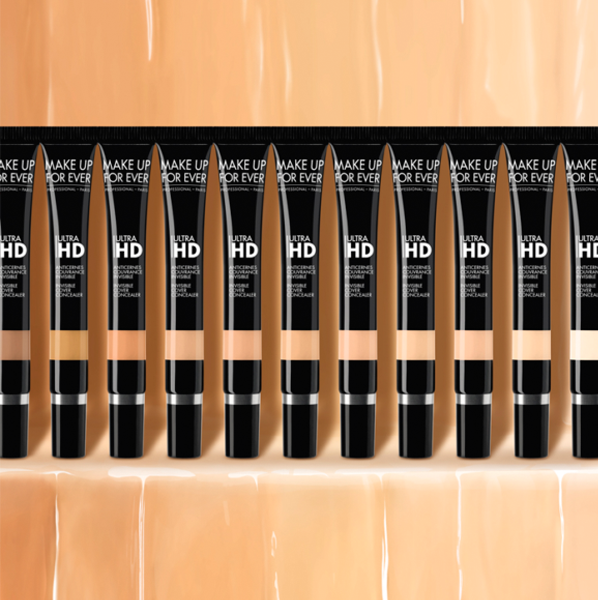 The Ultra HD Fluid Foundation is one MAKE UP FOR EVER product that you’ll hear beauty fans speaking about with reverence. It’s a true cult hit. 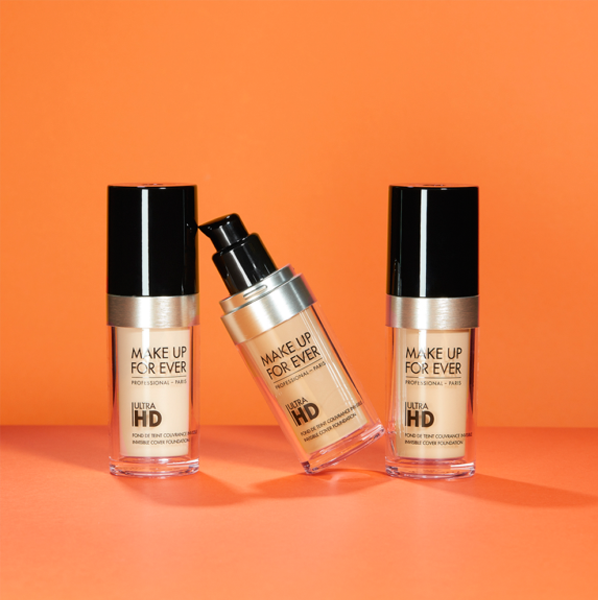 Originally created to answer the needs of makeup artists working in film and TV, the Ultra HD Fluid Foundation is a bit of a unicorn formula that looks incredible both on 4K camera and in real life. So that ‘your skin but better’ look you’ve been craving? It’s right here. An important thing to know about this formula is that it has an emphasis upon a natural finish, so you won’t find a mask-like effect or heaviness here. What you will find, though, is a perfectly even base that lasts all day, with an incredible number of shades to suit every depth and tone. 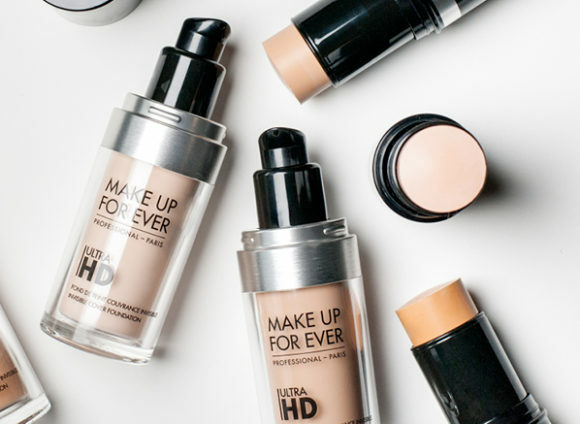 It’s the sort of foundation that is ideal for both daytime wear and evening wear; simply pair it with other items in the Ultra HD collection to increase your coverage. Talking of other products in the Ultra HD collection, here’s one you’ll have definitely have heard your favourite beauty blogger talking about before. The Ultra HD Stick is the stuff of dreams when it comes to a flawless finish, with a creamy and pigment-rich texture that feels like a second skin. Like the Ultra HD Liquid Foundation, it was developed for use on screen, and benefits from the same 4K Complex that guarantees an invisible, natural and comfortable finish. 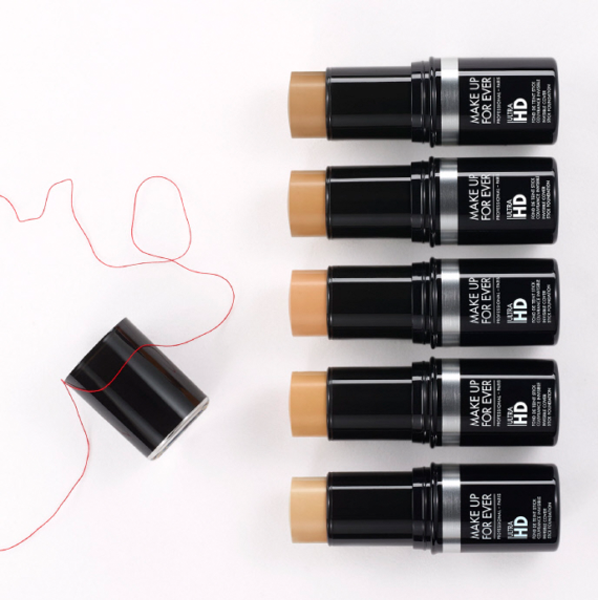 The stick offers a higher coverage result than the Liquid Foundation; simply draw it onto the skin and then blend for a truly flawless result, and slip the portable stick into your bag if touch-ups are needed later. As well as providing an all-over flawless base, the Ultra HD Sticks can be used in targeted areas to sculpt the complexion. 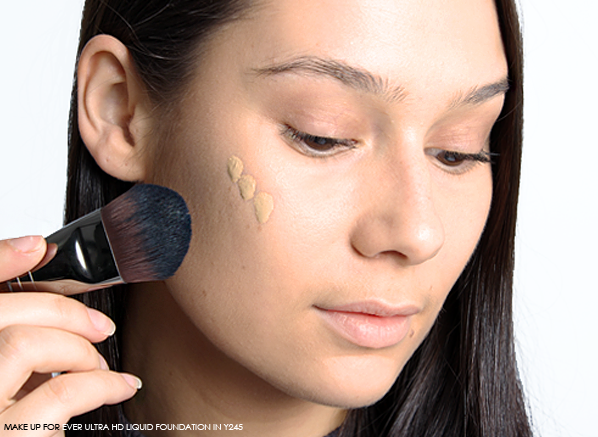 Opt for a slightly darker shade to contour your cheekbones, jaw line and hairline. 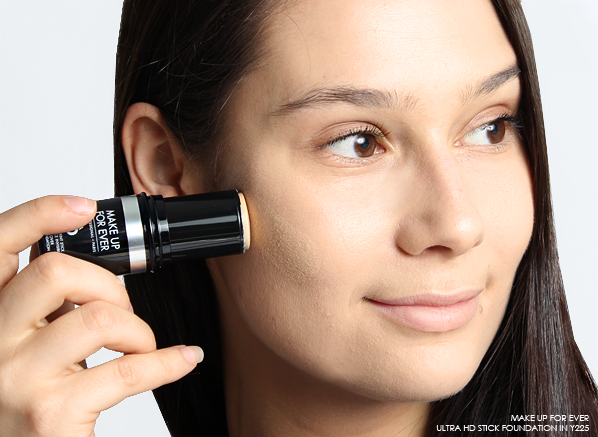 The final item in the brilliant Ultra HD trifecta is the Ultra HD Concealer, a product that I like to refer to as ‘real life Photoshop’. 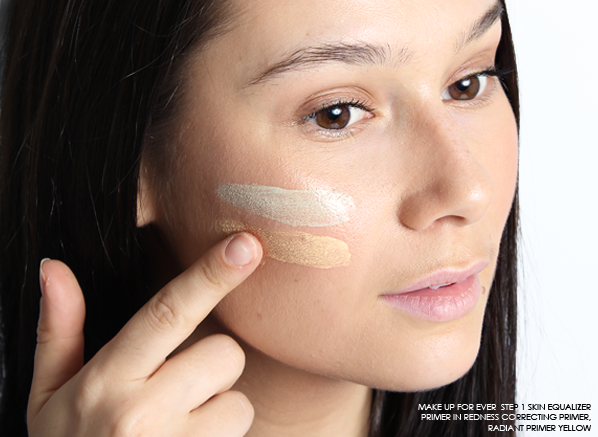 Forget about the disappointing concealers you’ve used in the past, because this is all about the instant impact; it packs a pigment punch, but it remains beautifully fluid and flexible to ensure a natural, comfortable look and feel. Dark circles are immediately diminished and the eye contour is completely unified for a wide-awake appearance. Like the other products in the Ultra HD collection, it manages to strike a perfect balance between flawlessness and natural radiance, so you won’t find any caking, creasing or heaviness here. It’s your all-in-one concealing hero, no matter what you want to cover up. Prefer your base to be a little fresher? 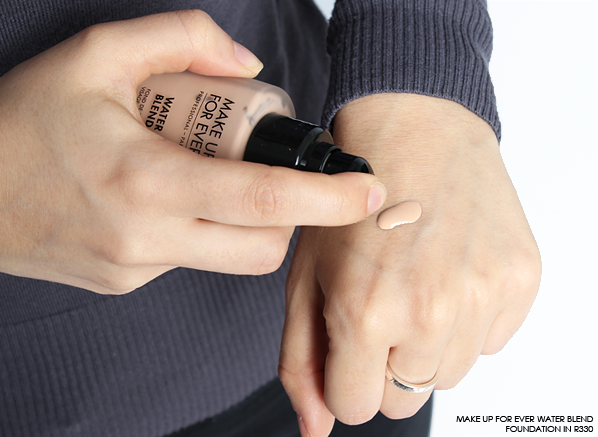 On the sheerer end of the foundation spectrum is the MAKE UP FOR EVER WaterBlend Foundation, a quick and easy formula for those who prefer a barely-there look and feel. This ultra-fluid foundation glides over skin and blends effortlessly with a satin finish, and as it’s water-based the complexion stays soft, comfortable and hydrated throughout wear time. A really interesting point of difference with WaterBlend is the fact that it’s waterproof and can be used on both the face and body. So whether you’re looking to smooth out the appearance of your legs before a night out, or blur imperfections on the chest, arms or back, it’s an indispensable foundation for everyone’s kit. 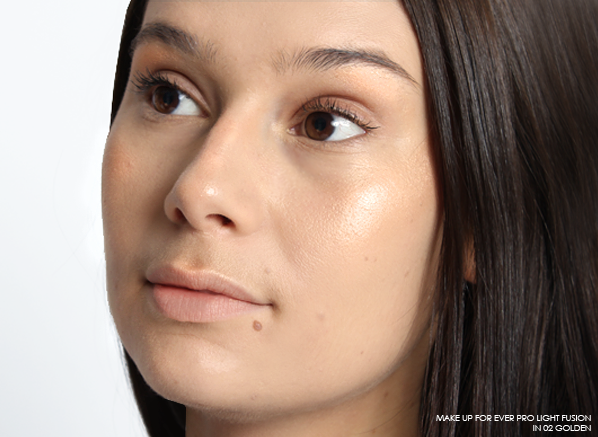 There’s nothing like a highlighter for bringing an ethereal glow to the skin. 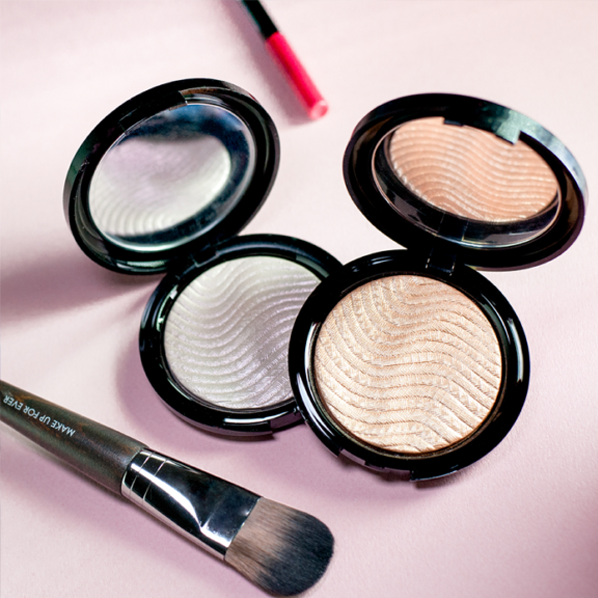 MAKE UP FOR EVER’s brilliant offering is Pro Light Fusion, a sculpting gel-powder illuminator that’s less shimmer, and more sheen. It caresses the high points of your face with incredible luminosity, and has an emphasis upon not looking too texturised or false on the skin – it just looks like beautiful light. There are two shades to choose from: 01 Golden Pink and 02 Golden. Golden Pink kisses the skin with a cool rose gold tone, while Golden creates a warm sheen of light that looks beautiful on cheekbones, the brow bone and the cupid’s bow. There’s never really a time when you don’t need your eyeliner to hold up against the elements, so I always opt for a waterproof formula. 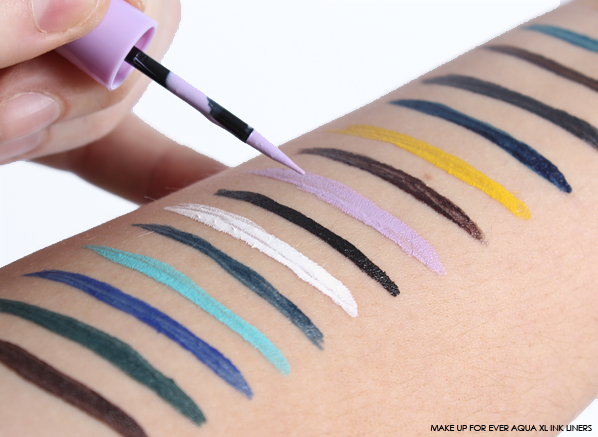 My favourite, by far, is the MAKE UP FOR EVER Aqua XL Ink Liner, which not only offers extreme resilience against water and sweat, but it also comes in an impressive array of colours. 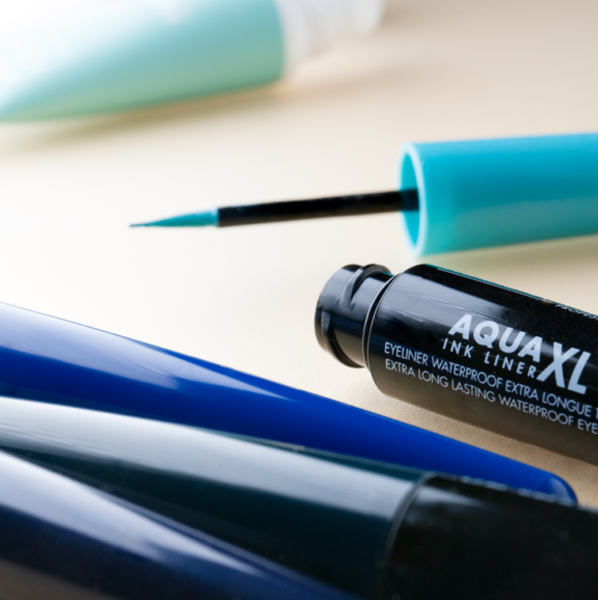 The Aqua XL Ink Liner effortlessly ticks every box: it’s long-lasting, highly pigmented, fluid and comfortable to wear, and its applicator is incredibly precise. Oh, and if you want further proof of its ability to last all day without smudging, fading or running, it was tested on the French synchronised swimming team. 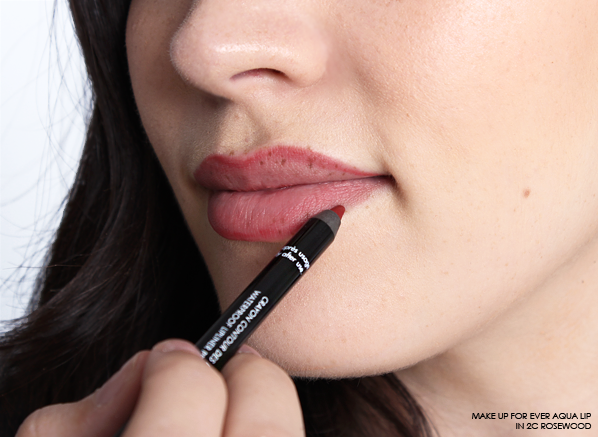 It’s an absolute workhorse for those who can’t live without their liner! MAKE UP FOR EVER has an incredible range of mascaras to suit every lash type, from short lashes to those lacking in volume. 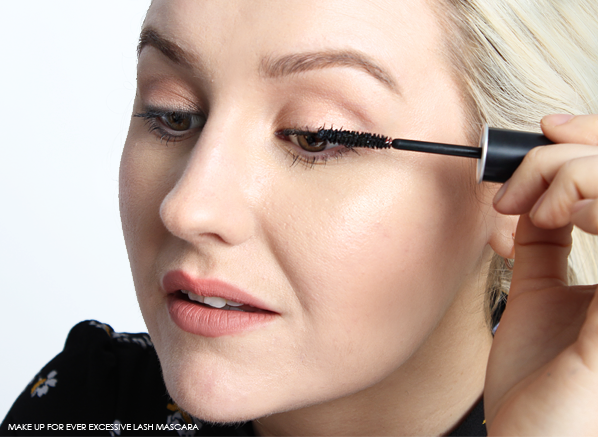 My favourite is Excessive Lash, a brilliant all-rounder that tackles a whole range of lash issues in one step. That includes boosting length, volume, definition and intensity for an effortless, beautifully finished fringe of lashes. The secret lies in its brush, which has a densely-packed, double-fibre head that’s designed to capture every lash, while its ultra-smooth formula glides on without flaking, smudging or running. 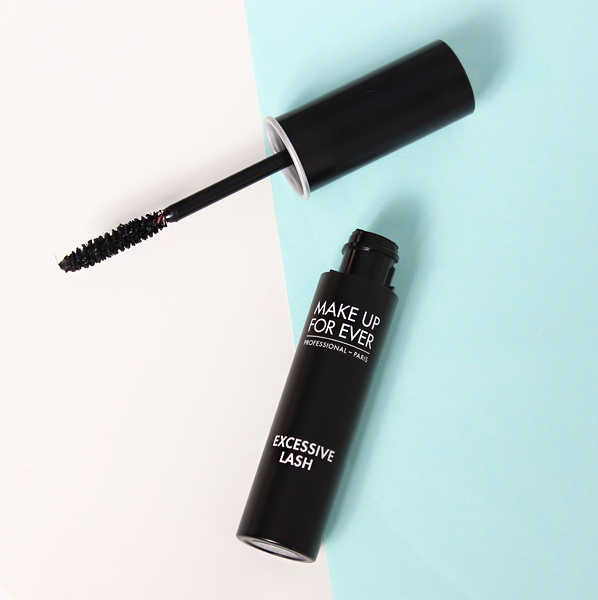 The Excessive Lash Mascara is dramatic enough to give your usual look a bit of extra eye-opening ‘oomph’, without making lashes look spidery or overloaded. It builds lashes up from root to tip with intense pigment for panoramic volume and curl that lasts all day – what more could you want? 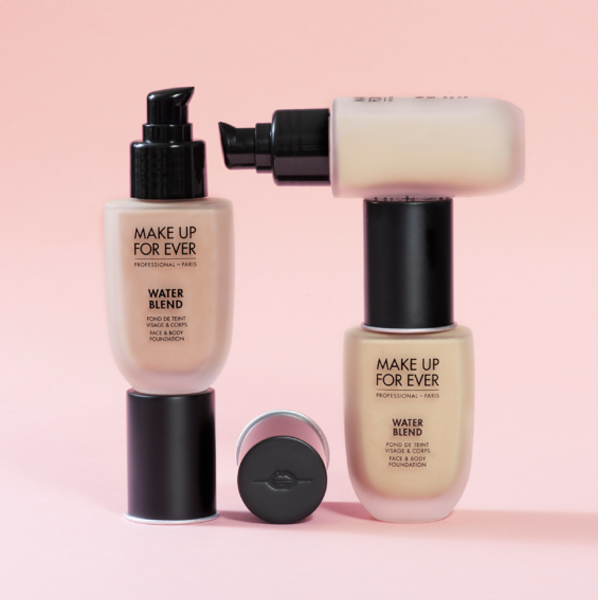 MAKE UP FOR EVER is well-known for their incredible waterproof formulas – and it’s not just about the eyes. The Aqua Lip waterproof lip liner pencil makes light work of shaping and colouring in the lip contour, resisting water and saliva to maintain the shape of your lips all day. It’s a truly brilliant formula that just doesn’t budge all day, no matter how much you eat and drink. This product is another one originally created for stage and screen, so its ability to last is unbeatable! Aqua Lip comes in a huge variety of shades that range from ‘my lips but better’ nudes all the way through to bold reds and purples. Its matte finish is comfortable, with volatile oils that aid application and then evaporate away completely to leave behind intense, non-transferable pigment. 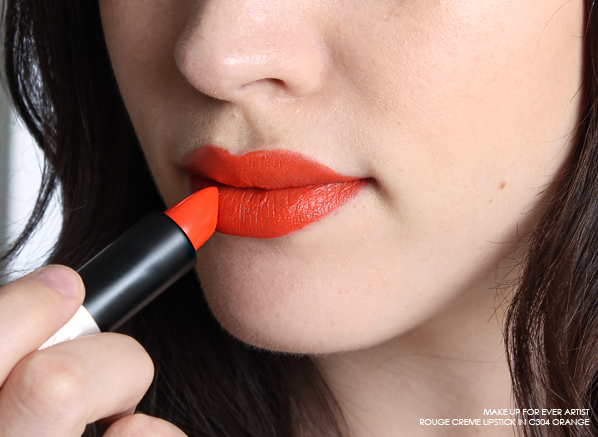 Every brand needs a classic lipstick. MAKE UP FOR EVER’s well-loved offering is Artist Rouge, a delectably soft, smooth and pigment-rich lip colour that comes in an exciting range of shades. There are two finishes to choose from: moisturising, medium shine Creme, and highly pigmented, velvety Mat. Each one offers spectacular coverage in a single stroke with vivid colour and plenty of comfort. Artist Rouge Mat offers 10 hours of wear, whilst you should be able to wear Artist Rouge Creme for 8 hours before needing to touch up your colour. 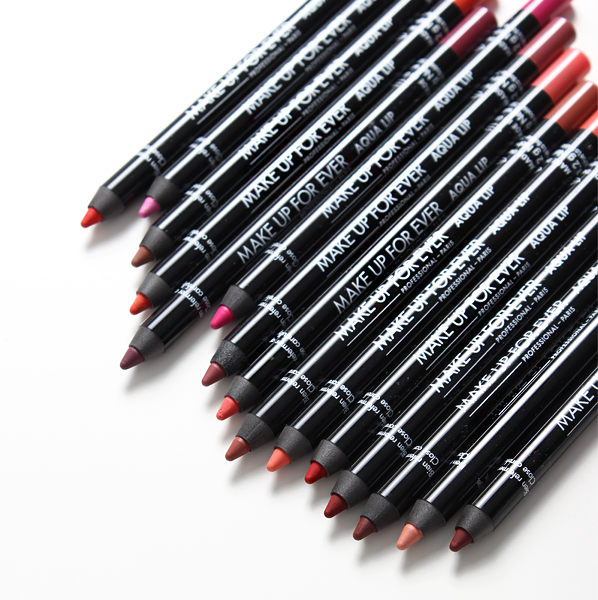 If you love lipstick, Artist Rouge is an essential. This entry was posted on Thursday, May 25th, 2017 at 3:03 pm and is filed under Make-up, New products, Swatches, Tried & Tested. You can follow any responses to this entry through the RSS 2.0 feed. You can skip to the end and leave a response. Pinging is currently not allowed.